This journal is indexed by 'Scholar Article Impact Factor' on the 20 March 2015. 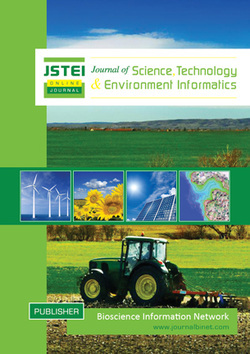 Journal of Science, Technology and Environment Informatics is a peer-reviewed and open access international journal that publishes original articles, review articles, case study, survey reports, short communications and technical reports. This journal provides a scholarly platform of publication for scientific developments and practical implications, research findings, communication of new innovations and emerging research topics of science, biological and geological engineering, technology transfer, scarcity of natural resources, climate change, global warming, environmental degradation, soil, water & air pollution, and associated informatics of related sciences.